I’ll admit The Hunger Games doesn’t sound great on paper. You’ve probably heard it mentioned in the same breath as phrases like “young-adult fiction”, “excessive shaky-cam”, “the new Twilight”, and “Battle Royale rip-off”. You might even have been put off by the overly-shiny Hollywood marketing campaigns with their CGI flames and Subway meal tie-ins, or doubted whether a 12-rated movie could really have anything worthwhile to say about the world we live in. Well, I’m here to tell you something important. If you watch The Hunger Games: Mockingjay - Part 1 on its own, maybe at the behest of a nagging loved one (I know that happens, because I’m usually the loved one), it’s unlikely to change your mind. It’s a bit slow, actually, at least compared to the other Hunger Games films. But, if you watch the whole series, with Mockingjay taking its rightful place as one part of a much bigger story, you’re in for a treat. Because, despite a slightly shaky start (in terms of camera movements and… well, everything, really) at the hands of director Gary Ross, the second and third films, directed by Francis Lawrence of I Am Legend fame, look set to cement The Hunger Games as one of the best and most memorable film franchises of all time. Out now on Blu-ray and DVD, Mockingjay Part 1 picks up a little while after the events of Catching Fire (which I’m about to spoil a bit, so you might want to skip ahead). 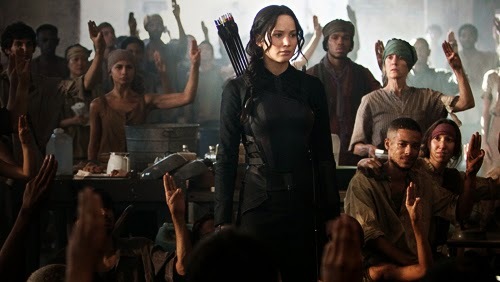 After escaping from the arena in the 75th Hunger Games, Katniss Everdeen (Jennifer Lawrence) has been whisked off to the underground headquarters of Panem’s supposedly-destroyed 13th district, along with her mother and sister and a handful of other rebel alliance members. Some of the other tributes from the Games weren’t so lucky, and have ended up in the custody of the Capitol — including Katniss’s on-off love interest Peeta Mellark (Josh Hutcherson). The movie tells the story of District 13’s efforts to overthrow the Capitol and restore order to Panem which, thanks to Katniss’s efforts as the “Mockingjay” — a symbol of hope and rebellion in the face of Panem’s cruel, oppressive government — is slowly descending into full-blown civil war. Grey-haired District President Alma Coin (Julianne Moore) and Gamemaker-gone-rogue Plutarch Heavensbee (the late, great Philip Seymour Hoffman) aim to mould Katniss into a sort of propaganda machine — “the face of the rebellion”, as it were — but by this point Katniss is damaged goods, beset by PTSD and traumatised by two years of unimaginable suffering at the hands of President Snow. Speaking of propaganda, Mockingjay continues The Hunger Games’ smart, thought-provoking exploration of both the realistic and fantastical aspects of Panem’s politics. President Coin assembles a camera crew and sends Katniss to a ruined district so her reaction can be turned into a campaign ad and beamed to the other districts; meanwhile, Peeta is being “hijacked” — like brainwashing, only worse — by the Capitol, and wheeled out in front of the cameras to call for a ceasefire. President Snow’s tyranny reaches discomfiting new heights, and even President Coin isn’t above making an unpopular decision or two — for the greater good, of course. Like 2013’s Catching Fire, Mockingjay is stunningly well-produced, acted, scored, and adapted. It almost feels like an industrial or scientific approach to film-making, rather than an artistic one, but that’s no bad thing when every single second of footage looks and sounds perfect. Elizabeth Banks returns as the ineffable Effie Trinket, Willow Shields and Paula Malcomson continue to deliver excellent, understated performances as Katniss’s sister Prim and unnamed mum, and Donald Sutherland’s President Snow is as likeable/terrifying as ever. And Liam Hemsworth continues to deliver all the charisma of an office supply cupboard as Katniss’s other on-off love interest, Gale, but you can’t have everything, I suppose. As I mentioned earlier, Mockingjay does take things quite a bit more slowly than the other Hunger Games movies. That’s not surprising, considering the third book does away with the bustling, colourful Capitol and its exhilarating child-murder pageants in favour of District 13’s spartan décor, grey jumpsuits, and daily work schedules. While the film isn’t boring by any means, it’s probably going to be a bit heavy on speeches and meetings for anyone who’s not already invested in the story. That said, the film does afford some well-realised glimpses of the war raging in the districts, and the fact they’re sandwiched in between the quieter moments only makes you all the more aware of the destruction, loss, and self-sacrifice going on above ground. The change of pace isn’t all bad news, then… and believe me when I say there’ll be more than enough action in the fourth and final film to make up for it. Think of “Part 1” as the calm before the storm. For anyone who is invested in the story and its characters — anyone who, like me, may have shed a beautiful, manly tear or two during Catching Fire’s more heart-rending moments — well, needless to say, your heart’s going to be in your throat for most of this movie, too. Mockingjay Part 1 definitely proves the odds are still in The Hunger Games’ favour and, if you haven’t already, you owe it to yourself to catch up on the first three films before Mockingjay Part 2 explodes onto cinema screens in November. I can’t wait. The Hunger Games: Mockingjay- Part 1 gets a well deserved 4/5. CeX & The Gadget Show! CeX opens store 2 in Mexico!